MLC Ch Vikram Randhawa during a meeting of Shakti Kendras in Leh on Sunday. LEH, (LADAKH) Dec 30: Member Legislative Council (MLC), Ch. Vikram Randhawa, today chaired a Shakti Kendra Sammelan at Leh which was attended by party activists and Councilors and CEC. 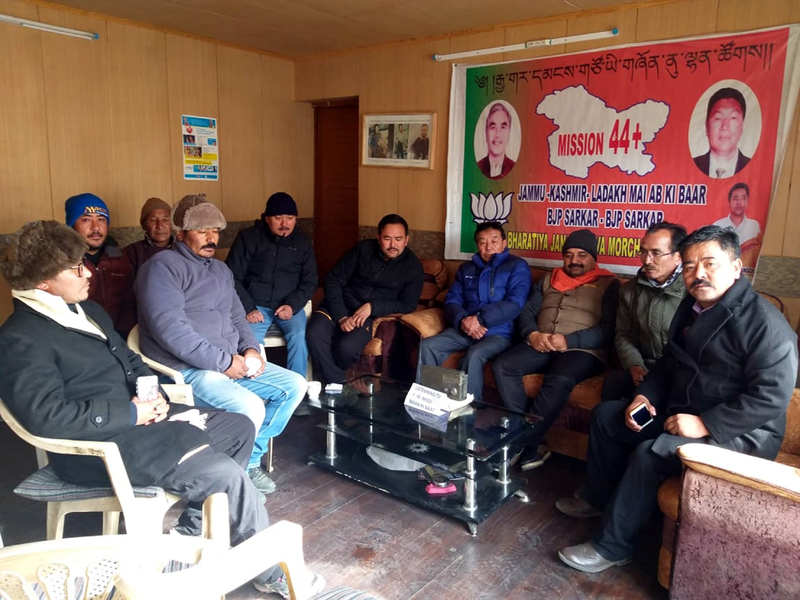 Shakti Kendra, Pramukh Sammelan was held at Bhartiya Janata Party district Headquarter under the leadership of Vikram Randhawa which was attended by district Executive Members of Bhartiya Janata Party besides Jamyang Tsering Namgyal, Chairman LAHDCL, Gyal P Wangyal, Deputy CEC, Executive Councilors, Councilors and Mandal presidents. The agenda of the meeting was to strengthen ground level structure by holding Shakti Kendra Pramukh Sammelans in the region to gear up its cadre to strengthen the party at the grass root level. Randhawa, while chairing the Sammelan said that BJP is committed for the all-round development of not a particular region or State but of the entire nation. He said that BJP is focused for the development of the Leh and Kargil and in this regard various projects are under consideration of the Government. He also enlisted various achievements and asked the cadres to deliver it to the masses so that they can know what the BJP Government has done. He said that the grant of full-fledged University to Leh, division status, Zojila Tunnel are few of the benchmarks of the Modi Government for the region which will change the entire development scenario of the people of the Ladakh region. Randhawa said that BJP is committed to carry forward the slogan of the Prime Minister of India, Narendra Modi, ‘Sabka Sath Sabka Vikas’ to the doorsteps of the people and urged the cadres to aware the masses to avail the benefits of the people friendly schemes launched by the Government. All Executive Members, Mandal presidents along with MLC Vikram Randhawa also listened to the last ‘Mann Ki Baat’ of Narendra Modi. The meeting appreciated the councils achievements in the short period under the chairmanship of CEC, Jamyang Tsering Namgyal with regard to office timing, sanctioning of Cluster University, a college at Khaltsi block and raising of infrastructure in health sector that includes addition of 150 beds in SNM Hospital and initiation of Dialysis Unit which will benefit scores of people.